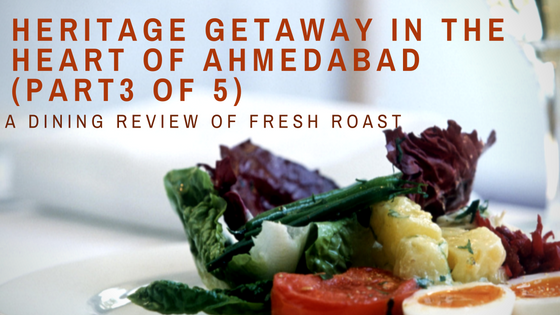 This is my third part of Heritage getaway in the heart of Ahmedabad. In this part, I am sharing my dining experience with Fresh Roast. Fresh Roast is restaurant owned and managed by Mani Mansion. Besides the casual dining, it also falls into the category of a cafe. It is a great place to hang out with friends. One of the features I like that it has three different seating areas. So you can sit inside if you want a really quiet place to sip a coffee and read a book. If you want to enjoy nature then sit outside, observe the plants and enjoy your meal. I really like all exposed stones on the wall, it gives that vintage look of the restaurant. The architecture is simple yet elegant with a touch of heritage style. They have picture wall, where old photos of the owner and his family have been displayed. Among all the heritage features I love the statue of Buddha. The Fresh Roast offers yummy Indian food, which you should never miss. They also offer a fusion flavor of Italian, Mexican and Indo-Chinese cuisine. I was so confused what to eat because the menu was filled with full of flavorful dishes. Don’t forget to try Authentic “Gujarati Thali”. “Gujarati Thali” is a specialty of the Gujarat and very rare to find outside of Gujarat state, so don’t miss to try it. I was exploring the restaurant in the evening and I found out a corner which was decorated with colorful balloons and hearts. So I assume it must be an anniversary celebration for someone. I think this can be great outdoor space to organize parties as well.